Ahh, eggs Benedict… a dish that, when placed before you, will inevitably evoke warm feelings of holidays, special occasions, and vacations past. Interestingly, eggs Benedict is an all-American dish that was created in New York, circa 1890. As the story goes, Mr. and Mrs. LeGrand Benedict were breakfasting at Delmonico’s Restaurant. Having tired of the standard fare, they spoke to the maître d’hôtel and together they came up with this iconic dish! Or was it Mr. Lemuel Benedict at the Waldorf Astoria, who in an effort to cure a well-done hangover, requested poached eggs, bacon, toast, and a small pitcher of hollandaise…? Either way, a grand thank you goes out to the responsible culinary genius/es. Surprisingly, this delectable dish is easier to make than you may think. 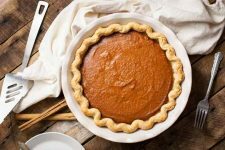 Most of the preparation can be done ahead, making it the perfect dish for a busy holiday morning or making brunch for a crowd. 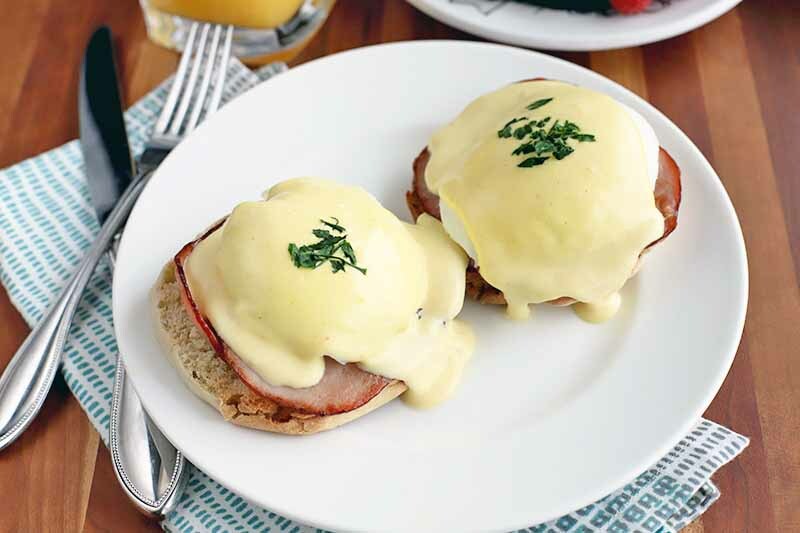 Try our Do-Ahead Poached Eggs and “Magical” Blender Hollandaise for a little wham-bam-bliss! If you’d like, you can prep the sauce and the eggs in advance, to free up some time in the morning when you’re ready to serve. Poach the desired quantity of eggs as you normally would, but under-cook them slightly. Just about a minute shy of your normal cooking time should be fine. 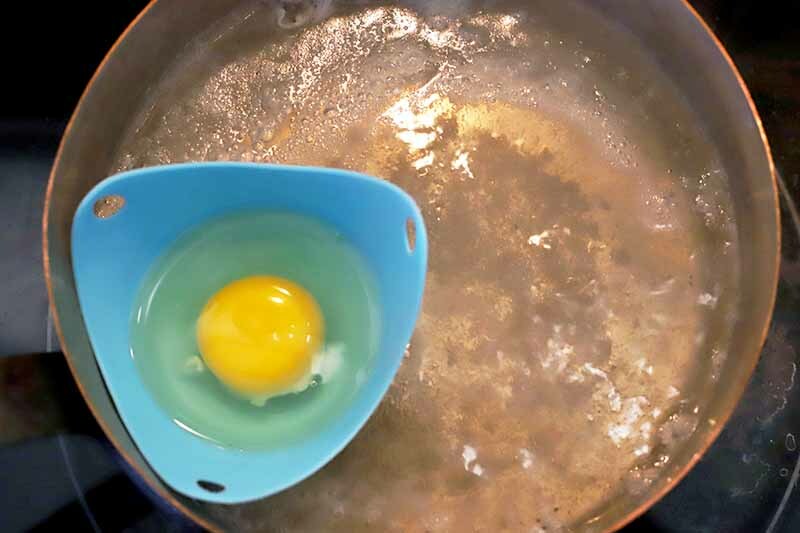 The whites need to be nearly set, so that you can safely remove the eggs from the hot water with a strainer-type ladle. Then, place them in a bath of ice water. 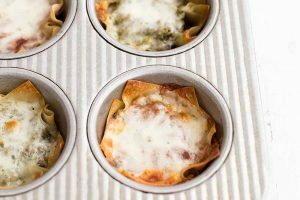 When they are cooled, cover the container and refrigerate them (up to overnight) until you are ready to reheat just before plating. When ready to serve, trim off any ragged edges with kitchen scissors if you like, for a pretty presentation. 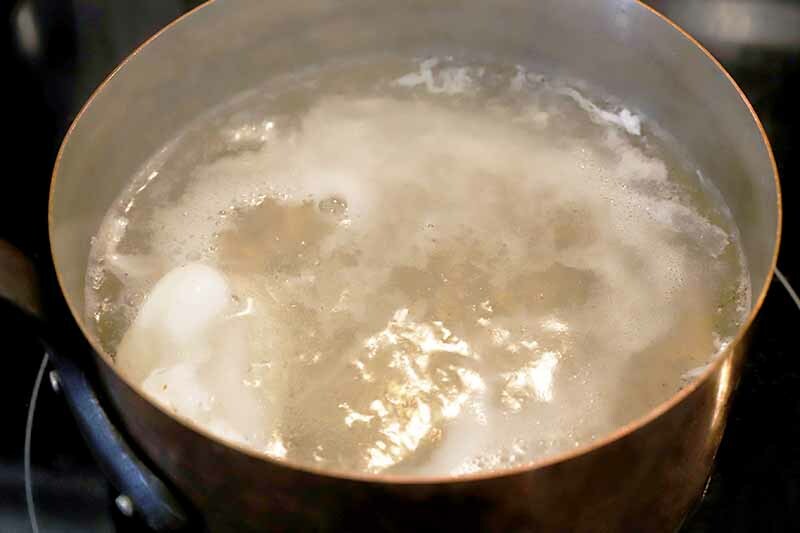 To reheat and finish cooking, place several eggs at a time in a pot of gently simmering water for about a minute. Be careful not to overcook them, as you want the yolks to run when you cut into them. 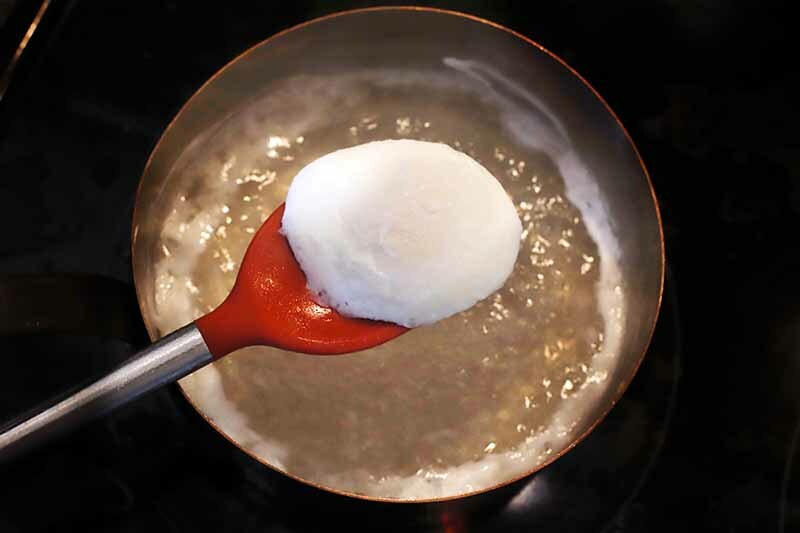 You can hold batches of fully cooked poached eggs in a bath of warm water for quick service. 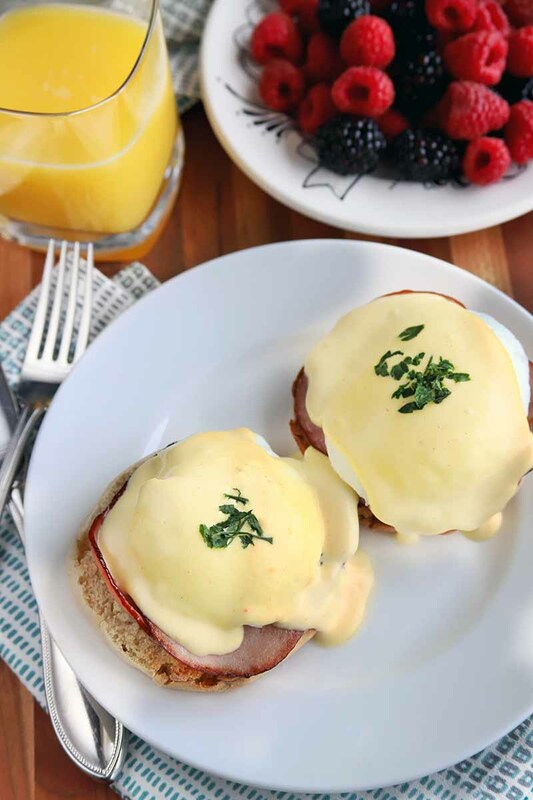 There’s nothing better than the perfect eggs Benedict with magical blender hollandaise for breakfast, especially when the sauce is so easy. Melt butter in a small saucepan on the stove, or a glass measuring cup in the microwave. 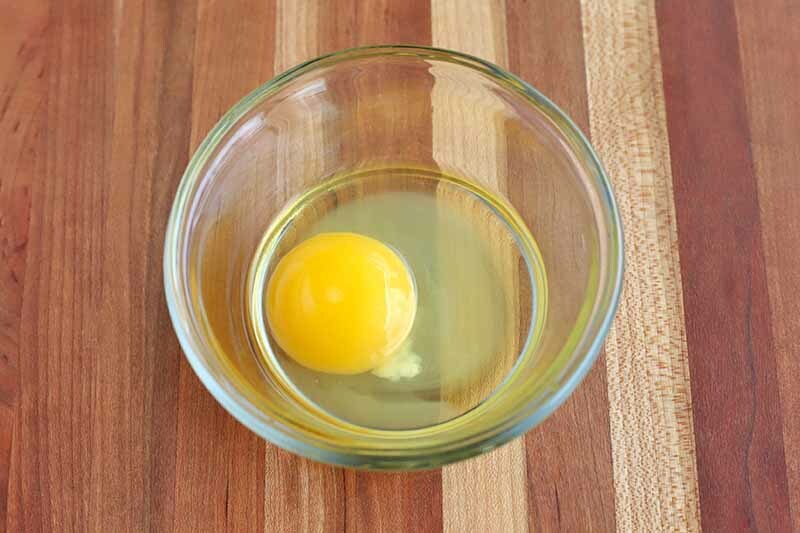 Add egg yolks to a blender or food processor. Pulse to quickly blend. With the blender on, slowly add melted butter in a steady stream. The sauce will form and magically thicken as it blends. Add lemon juice and cayenne pepper. Blend to combine. While warming the hollandaise, toast the split English muffin halves in a toaster oven or toaster. Heat about 1 inch of water, 1 teaspoon salt, and 2 teaspoons white vinegar in a 2-quart saucepan, and bring the mixture to a simmer. Crack one cold egg into a small custard cup or similar container. Repeat with each egg. With a long-handled spoon, stir water in a clockwise direction to form a whirlpool. Bringing the cup close to the water, gently tip the egg into the whirlpool. This helps the edges to form without feathering. Turn off heat and allow eggs to poach for 5 minutes. Resist the urge to nudge the eggs. Heat skillet over medium heat. Add Canadian bacon and brown on both sides, about 1 minute per side. Remove slices to a small plate and cover with aluminum foil to keep warm. Toast the English muffins, and place two halves on each plate. Warm up the hollandaise over low heat in a small saucepan while whisking gently. 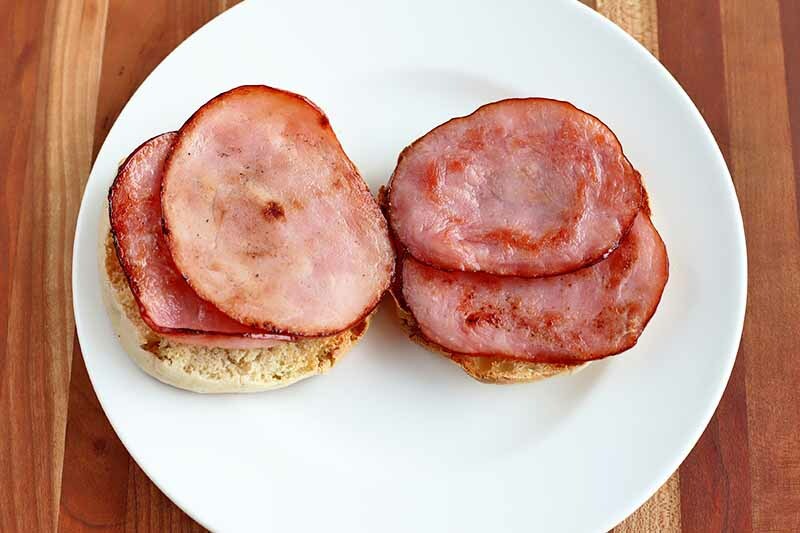 Place Canadian bacon on top of each muffin, distributed evenly. Place one poached egg atop each muffin half. Ladle warm hollandaise sauce over the top as desired. Garnish with a sprinkle of fresh parsley and serve immediately. 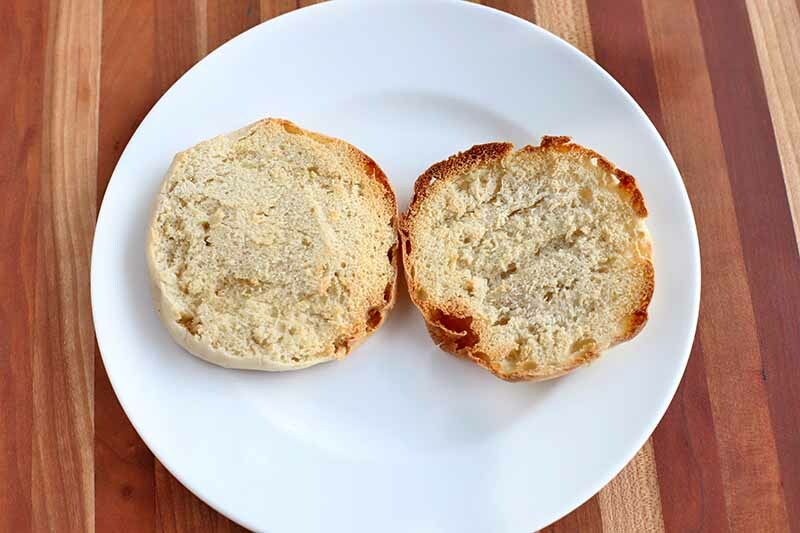 Split the English muffins in half and set them aside. Juice a large lemon to get 1 tablespoon of fresh juice. Chop enough parsley leaves until you have 1 tablespoon in total. 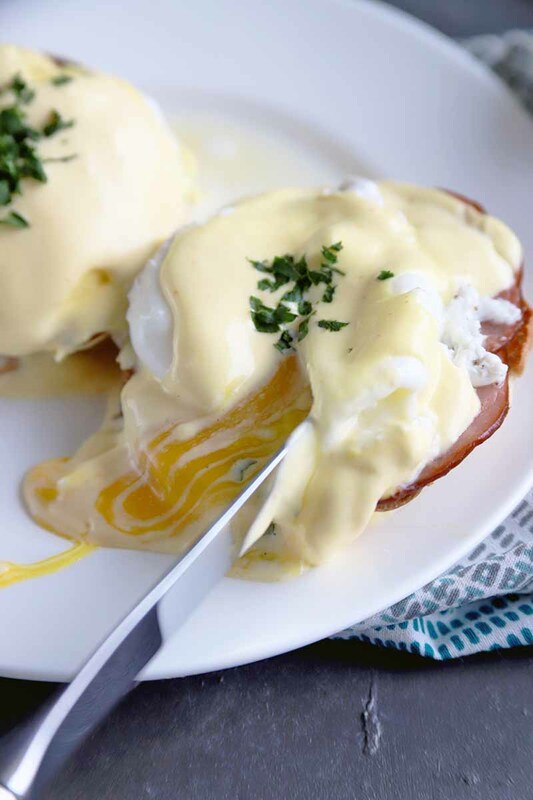 Some cooks like to poach first, and others like to start with the hollandaise. 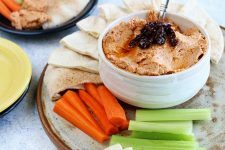 If you’re making this in advance, it’s easy to prep these components a day ahead, and rewarm them when it’s time for brunch. The choice is up to you, but we’ll start here with the sauce. In a small saucepan or in a glass measuring cup in the microwave, melt the butter. Set it aside. Add the yolks to a blender or food processor. Pulse to blend. With the blender on, slowly stream the hot butter into the yolks. The sauce will form and thicken as it blends. Add the lemon juice in a thin stream and cayenne to taste, blending to combine. Scrape the sides down if you need to. 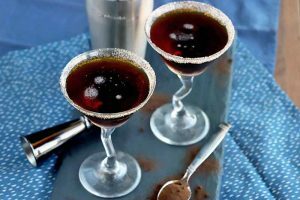 Pour into a small saucepan. When you are almost ready to serve, place over low heat and whisk gently to warm through just before serving. 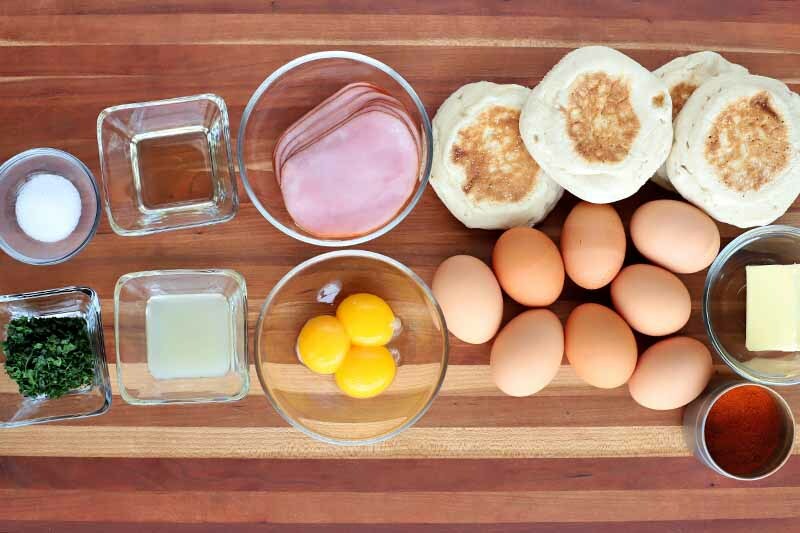 It’s really up to you exactly how you want to proceed, but if you have a helper in the kitchen, recruit them to toast the English muffins, and help you out with prepping the bacon! While the hollandaise is warming gently, toast the English muffin halves in a toaster oven or toaster to the desired level of toastiness. Warm a large skillet over medium heat. 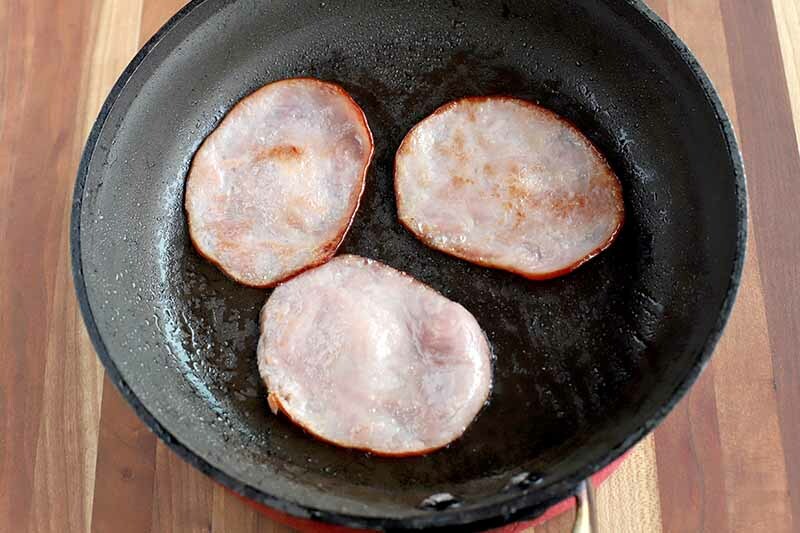 When the pan is hot, add the Canadian bacon. Brown it on both sides, for about 1 minute per side. If you don’t have a large enough pan to heat up all of the bacon at once, you can do this in batches. Transfer the Canadian bacon to a plate and cover with aluminum foil to keep warm. 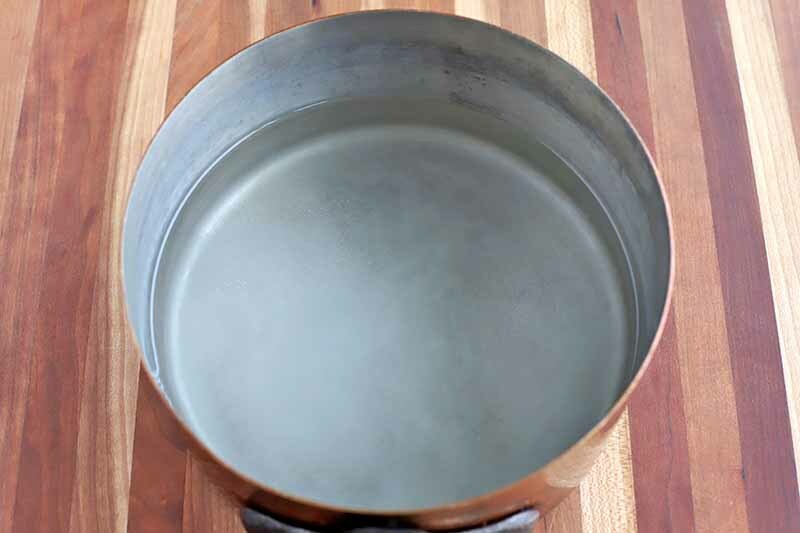 Heat about 1 inch of water with 1 teaspoon salt and 2 teaspoons white vinegar in a 2-quart saucepan. For larger batches, I recommend using a 12-inch skillet and poaching without stirring. For more poaching tips, check out our helpful guide. Crack one cold egg into a small custard cup or similar container that is small in size. Repeat with each egg, being careful not to break the yolks. 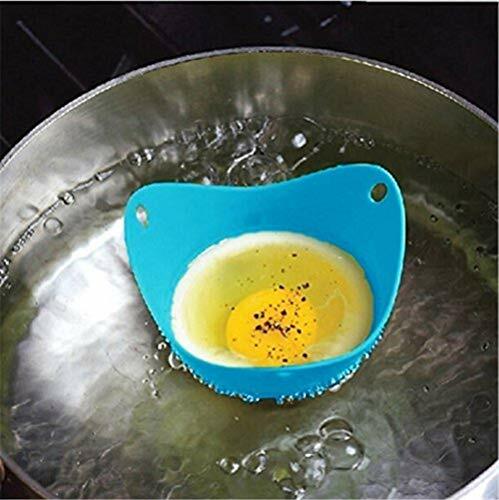 Silicone egg poaching cups also come in handy for poaching, if you’re not super comfortable with the process and you want to cheat a little. I like these, and they’re available on Amazon. Use a long spoon to stir the water in the skillet in a clockwise direction to create a whirlpool. Bring the cup with the egg close to the water and gently tip it into the whirlpool. This will help the edges to form without feathering. You will be poaching in batches, approximately 2 at a time. Turn off the heat and allow the eggs to poach for 5 minutes. Do not touch the eggs as they poach. Remove them from the water with a slotted spoon and transfer to a plate. Place two toasted English muffin halves on each plate. Top with a slice or two of Canadian bacon on each. 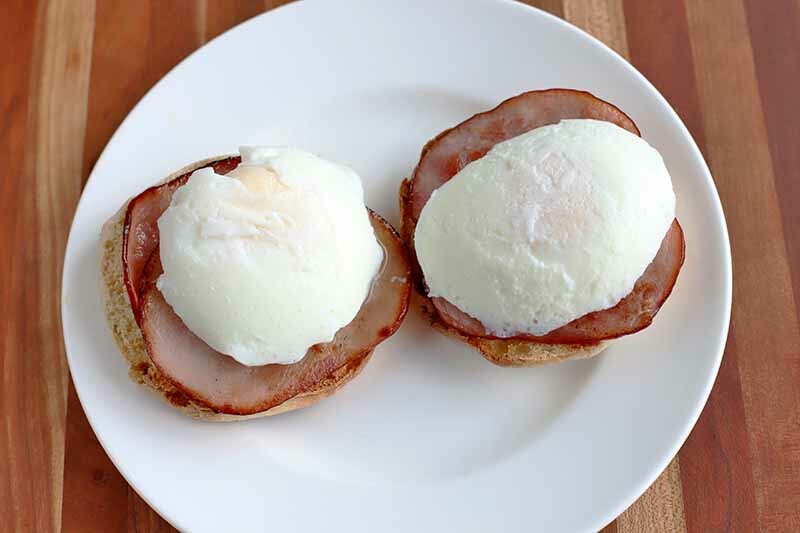 Place one poached egg on each muffin half. Top with warm hollandaise sauce and garnish with freshly chopped parsley. Is This Supposed to be Spicy? For those of you who are unsure about how much cayenne to add without making the hollandaise too spicy, I recommend starting out with 1/4 teaspoon of ground cayenne pepper when making the sauce. After adding it to the saucepan and warming it, give the sauce a taste. If you want more heat, add cayenne pepper in increments of 1/8 teaspoon at a time until you get the heat level you want. For me, this was 1/2 teaspoon because I like my sauce spicy. If you go over that, phew! You are a spice rockstar. Do you like your hollandaise spicy? Will you make the components in advance, or call in the gang on Sunday morning and make everything together? Tell us in the comments below and come back to rate this recipe once you try it for yourself. Photos by Meghan Yager, © Ask the Experts, LLC. ALL RIGHTS RESERVED. See our TOS for more details. Product photo via A-cool. Originally published on April 22, 2015. Last updated: April 12, 2019 at 19:09 pm. With additional writing and editing by Meghan Yager and Allison Sidhu. Wow, thanks for this recipe. I’ve never thought of using the blender to make hollandaise, I always just whisk it BY HAND which gets exhausting. Also, is Canadian bacon the traditional recipe? I’d use ham or regular bacon most of the time. Actually, using the blender is the safest and easiest way to make hollandaise, as told by my mom. Also, by replacing Canadian bacon with regular bacon it will kind of change the overall taste of the recipe and in my opinion it won’t taste that good, but feel free to try! 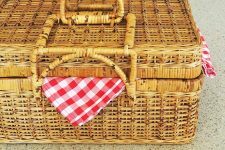 Isn’t it fun to find out about time saving tips? 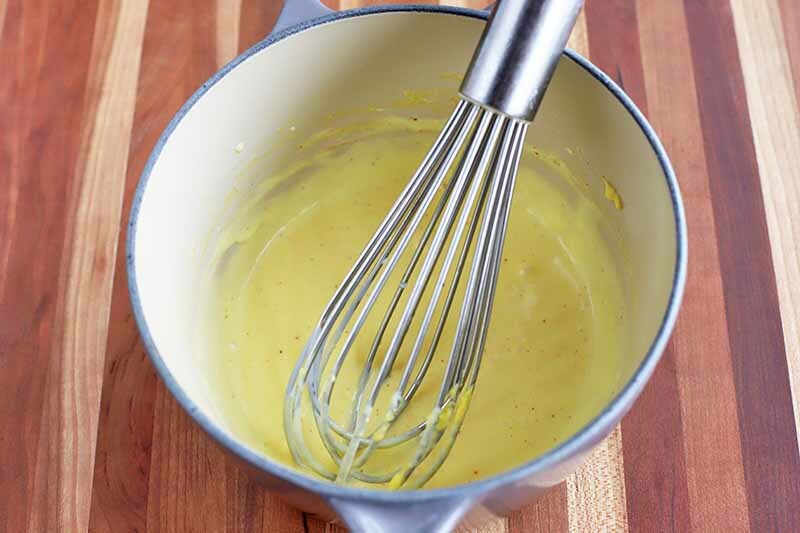 Your blender can save you time and tired wrists from whisking this decadent Hollandaise sauce. And yes, the traditional recipe calls for Canadian bacon. I’ve had the pleasure of enjoying many versions, so encourage your creativity. This is one of my favorite dishes, not only for breakfast but anytime. I’m not great at making poached eggs, but that’s a great tip about not over cooking the eggs and the iced water to keep them. You can use vegetarian bacon as well these days which tastes and smells as good. I’m with you on this one! This makes a terrific meal anytime. Making your eggs ahead of time will make it a slam dunk when it comes time for service. 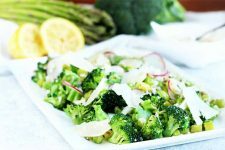 Try it topped with a few steamed asparagus tips for another yummy vegetarian option. This is one of my favorite egg dishes too. Bacon and egg is always a winner but sometimes, you want to mix things up a little! I am also having a little giggle about an “all-American” dish involving Canadian, British and French foods! This is one of the most popular egg dishes ordered in fine restaurants. And yes, I see the humor in this American dish featuring Canadian bacon. What can I say? The day this dish was created, American ingenuity was alive and well. 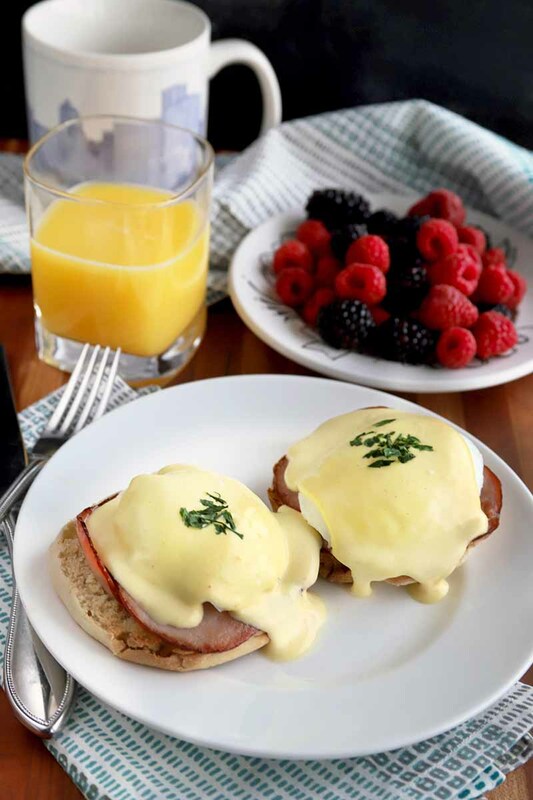 Eggs Benedict is such a simple yet elegant dish to serve. I tend to save it for occasions or entertaining guests. I’ve always told the single men in my life to learn to make this one dish & have it in your arsenal for the ladies you meet. Even if you’re the worst cook on the planet you can master this one. Blender hollandaise only simplifies it that much more. Great advice for any single man or woman! This is a dish dressed to impress. I’m so happy to hear you enjoy blender Hollandaise too. I have never poached eggs or made holliandaise before. I’ve never even tried eggs Benedict either. But this recipe has convinced me I should try it. It’s not going to be something I just throw together for a quick breakfast, though. 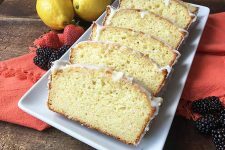 This one I think I’ll take my time with at first, lol thank you for the recipe (as well as the story about me and mrs Benedict. That kind of information always makes it more fun). Thank you for sharing and I’m so happy you enjoyed my story. 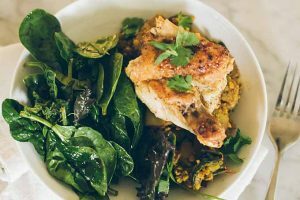 You’ll enjoy making this dish and yes it is a step by step process, but once you’ve got it, you’re golden. Try pre-preparing as much as you can, then assembly is quick. Eating it is bliss. 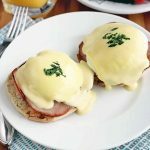 I have never tried eggs benedict before but after seeing this recipe I will definitely be trying it! 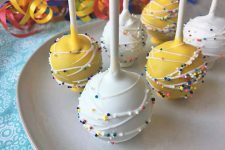 The picture drew me in and after seeing the recipe it looks easy to make. I’m so excited to hear about your adventurous culinary spirit. There’s no doubt that this dish is a great one. And jut think, you’ll be able to add it to your list of “my best dishes”. Enjoy! You know I had this one time in a really nice restaurant and it wasn’t so good. This version here looks like it would be much better especially that sauce. Sometimes we are disappointed with a restaurant dish and that is unfortunate. Could be that experience is just what you needed to make you show them how it’s done. This version is fabulous. Hope you enjoy it. This looks simple and delicious. You have to make sure you have the right kind of bagel though. Thanks! This is a wonderful dish, breakfast, brunch, lunch, or dinner. You can’t beat that. Traditionally, it is made using an English muffin. A bagel is an interesting idea for sure. I’m just not sure how well it would absorb the decadent Hollandaise sauce or lovely egg yolk. You’ll have to let me know. I have to say I have never had eggs like this! What a wonderful and original idea and it seems so simple. I will have to try it out and invite over a few guests for breakfast. I am sure this will be a delicious treat for everyone joining me for breakfast. 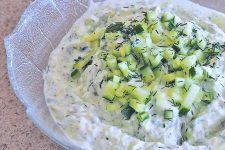 It’s so good to hear that you are planning on enjoying this dish with friends. What could be better? It is delicious and impressive to boot. I hope that your guests enjoy it and that you all share much food and laughter. I’m a sucker for Eggs Benny and that picture had me salivating! Thank you for the hollandaise recipe. I haven’t tried to make this at home. I always find it too intimidating even if it does look simple. I never know why Eggs Benny in restaurants/cafe cost so much when it’s so simple to make! Your making me hungry just reading your comment. And Eggs Benny is a great nickname. Maybe if you make it for Easter you could call it Eggs Bunny! I regress. 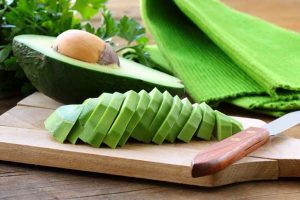 You’ll find that it is a simple dish once you do the preparation. Hope that you enjoy it at home soon. Eggs Benedict is by far my favorite breakfast dish and I am so incredibly excited to try the Hollandaise sauce out by using a blender! I would have never expected to see that, preparing it by hand is exhausting. It is worth the effort but this way will be so much quicker and give more time to feel satisfied by the food and not so much the prep work! 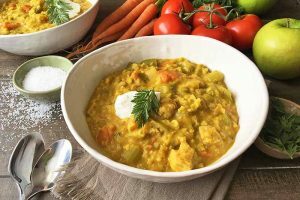 When I was pregnant with my son this was one of my favorite dishes to make and really makes you respect a chef’s job, there are so many items cooking at once and you have to time it perfectly for it to all come out warm and ready at the same time. Very excited to try this recipe out, thank you! I’m thrilled to hear that you are ready to try blender version. 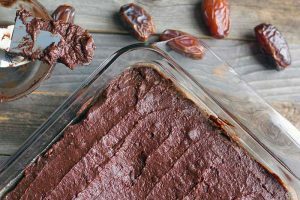 You’ll find it so much easier than a double boiler, plus it saves a lot of whisking. 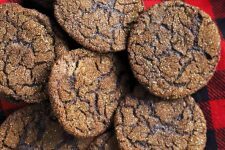 I hope that the time saving tips in this recipe will make this a pleasure for you to prepare. We know it is a pleasure to eat! I can’t tell you how happy I am to find this post! I love eggs benedict, but every time I wake up wanting to make them, I give up because of the hollandaise sauce. For a foodie disguised as someone who doesn’t know how to cook, that sauce is always intimidating. So I give up and make eggs and toast… boring! This hollandaise looks more than doable, and totally delicious. 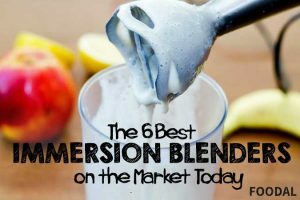 We recently received a really nice blender as a gift, so I’m going to be trying this out very soon. Bookmark! 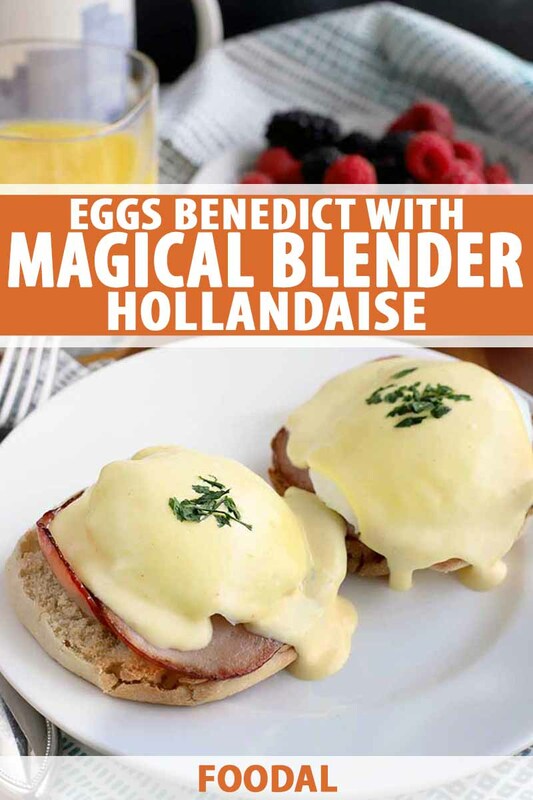 That’s why it’s named “Magical” Blender Hollandaise. Taking the work out and putting the enjoyment into making great food is my pleasure. 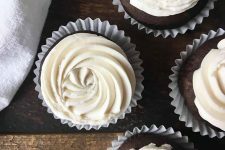 Thanks for trying out your new blender with recipes from Foodal! I’ve only tried this when having breakfast at a hotel restaurant. I have never tried making one myself. I guess I’m too impatient, or that I’m just often too hungry to prepare it and want instant eggs – a.k.a scrambled eggs to gulf down immediately. However, I’m a bit curious about the Hollandaise sauce. Seems very interesting. I wonder what you can use this sauce for besides the one mentioned here. Not to worry. This is a simple and quick way to make the sauce. Try it atop steamed vegetables, fish (especially salmon), and yes it is even scrumptious on scrambled eggs. I have never even heard of this preparation method. I do appreciate the story behind this dish. I have boiled eggs in the past when making tuna. Poaching them would be a new technique for me. This dish looks so simple to make and have for breakfast. Lucky you! You’ve come across a new dish and it’s a great one. 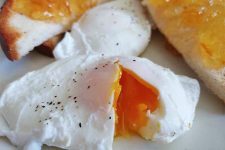 Poached eggs can be used many ways, even plain with simple toast. Please talk the plunge and give them a try. 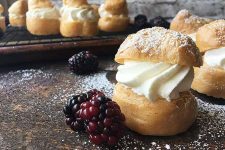 When you feel like enjoying Eggs Benedict, you’ll find all the shortcuts and tips right here at Foodal. I love dishes like this, and I love anything that has to do with eggs, but I’ve never tried eggs benedict. It’s one of those things I’ve always wanted to try but never have, just like bagels and lox. However, I’m trying to broaden my palette this year and get into cooking more, so I believe trying out something like this is a good idea for me. I wish there was a way to save or like articles on here so that I could keep up with all the things I wanna try! Yum! This looks like a perfect option for a Sunday breakfast, some coffee and cookies with it sounds just perfect. I’m actually amazed that I haven’t heard about this dish before, I’m a big fan of bacon and bread, but I would definitely prefer this one without the egg yolks, it would probably don’t be the same thing but I don’t really like them. It has been a long time since I have had some Eggs Benedict, but I think that it is about time for me. 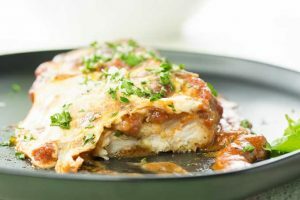 This one looks like a good recipe too, and it is always about the sauce, so I am hoping that this is that one that makes me say wow. I have some high expectations though, so hopefully I am not disappointed, but I think I am safe there. My husband has tried to make this for breakfast a couple of times. He has had varying results with the sauce. 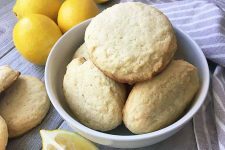 One batch was sandy (eww) and another batch was WAY too lemony (didn’t notice the less lemon comments on the recipe he used until it was too late) and another batch turned out pretty good. It is a pretty time consuming recipe though. I think he will like this mixer way of doing it. I will show him this recipe next time he starts poaching eggs!